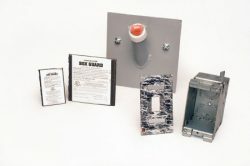 Choose this economical 1 inch- Membrane Firestop Kit for all the parts you need to firestop a single outlet inside a firewall. Works above the grid and below the grid. Saves money over purchasing items individually. When paired with our caulk, the 1″ Membrane Firestop Kit includes everything you need to fire stop a single outlet inside a firewall. UL listed and Made in the USA. 1-inch Membrane Firestop Sleeve including UNIQUE Intumescent Putty to seal the system. Click on the links above to see the individual product pages for each item in the kit. Our Membrane Firestop Sleeve is also available individually in 1-inch or 2-inch sizes. See also Unique Fire Stop Caulk– – You will apply a small bead of firestop caulk to the back of the plate and around the sleeve to seal the Membrane Firestop to the wall. Made in the USA exclusively by UNIQUE Fire Stop Products.